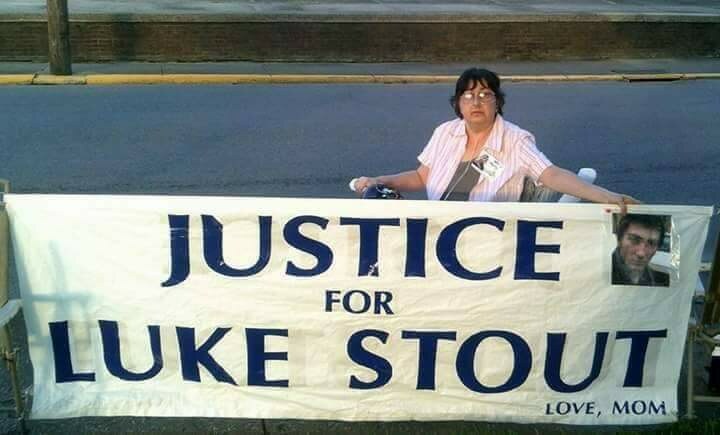 “I love you, baby, your brothers love you, the four musketeers,” said Luke’s mother, Elizabeth Stout. 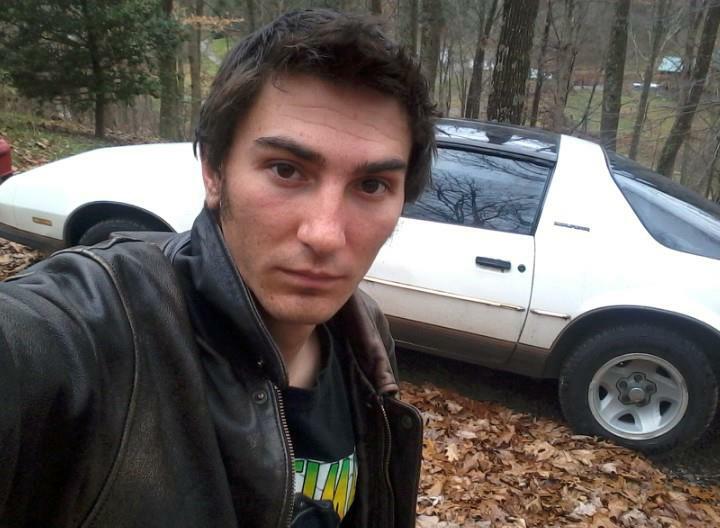 Luke Stout was 24 years old when he was last seen by his mother, Elizabeth and his brother, Kenny on July 18, 2012. He told them both that he loved them, and that he’d be back later that night. His family last saw him walking down the driveway of their home on Hickory Flat Road, carrying a green bicycle frame. He had made plans with a friend named Dillon to meet up and fix the bike. Luke anticipated on giving the bike to Dillon and Dillon was supposed to help Luke fix his own. (A day or so before his disappearance Luke’s bicycle handlebars had messed up, causing him to have to abandon it in Buckhannon with plans to return for it later). Dillon had arranged for someone to give Luke a ride on the day of his disappearance (Luke had forgotten to pay his car insurance and it had lapsed) but as far as I know, the identity of that person is unknown. For now, all we know is he was last seen between the hours of 3:00 pm and 5:00 pm. After Luke walked down his drive, his whereabouts culminate into a seemingly endless mystery. As I’m gathering my thoughts, let me begin with what I’ve been able to piece together about this young man based on what pictures I could find and my conversations with his mama. He was a carpenter by trade, and had been since he was 18. He was a hard worker, who took pride in and loved the work that he did. He was compassionate and poetic, loved animals, and was free-spirited in his own right; he was also deeply devoted to his family, opting to live at home and take care of his terminally ill mother instead of looking for his own place. His brothers also took turns staying with her so that Luke could work, and have some time to himself. He never complained about the situation or the decision to live at home. He only had the occasional post on Facebook claiming to be bored, and asking for people to message him for chit-chat. There are several of his drawings posted on his facebook as well, he was an incredibly talented young man and it’s all the mo re apparent the more I learn about him. Art. Poetry. Music. He enjoyed skateboarding and comic books, video games, he even played World of Warcraft. Luke and I just so happened to play the same character class on WoW… so at this point, I feel like he could easily have been included in my small circle of friends. That in and of itself makes me take this case personally. With the amount that I share in common with Luke, I could very well have been him. 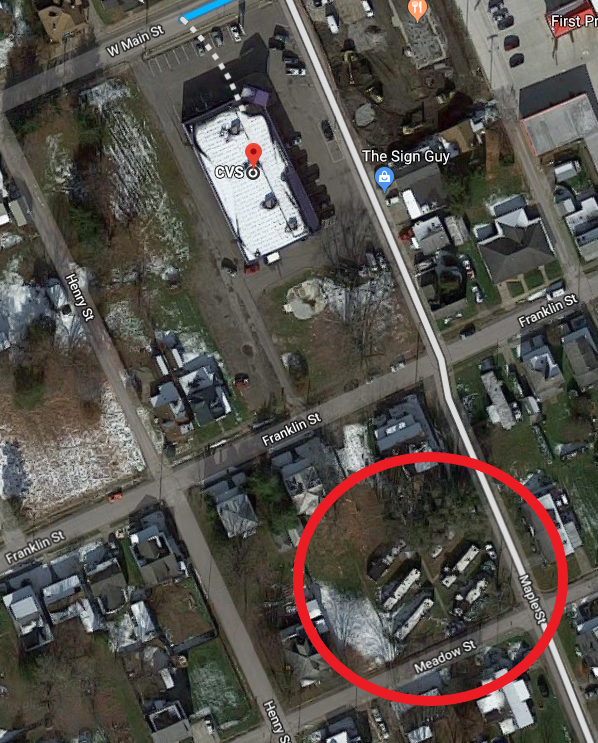 The trailer park where Luke’s bike was found. Let’s continue with the circumstances that followed his disappearance…A few days after Luke’s disappearance, his brothers actually located his bike (the one that he had to leave in town because the handlebars messed up). It was leaning against a trailer in a trailer park behind the CVS in Buckhannon. Apparently, the person who was living in the trailer at the time was a man nicknamed ‘Buda’. Luke had been to that particular area before, but it’s unknown why or who knew that was living there. 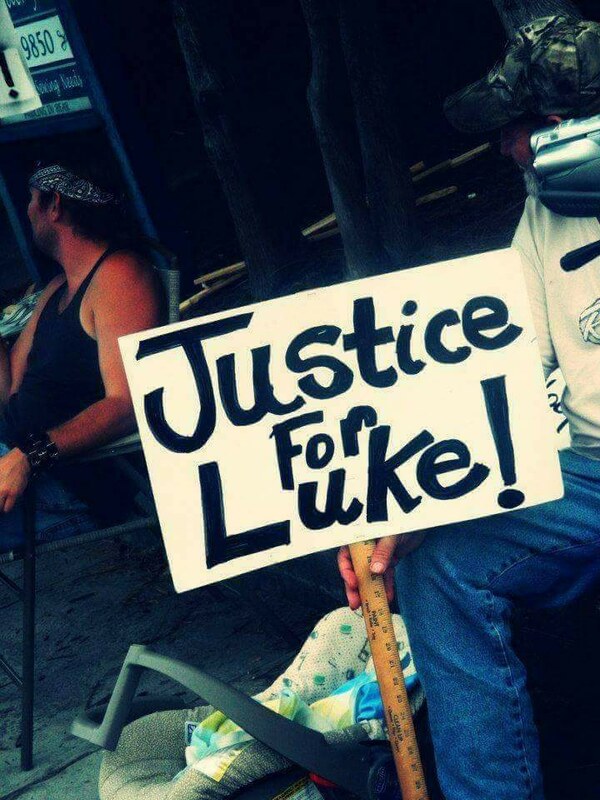 The brothers quickly called the police and advised them of their discovery, hopeful that they would come to the location and begin questioning the residents of the area about whether they’d seen Luke within the few days that he’d been gone. They were met with disappointment as the police simply told them that they should load up the bike and take it home. They had no interest in questioning anyone. 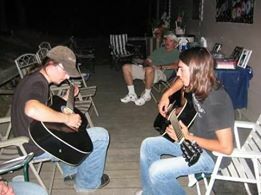 To the family’s knowledge, they never questioned the friend, Dillon, that he was supposed to be meeting up with either. Guess what happened whenever they tried to get help for Luke? The West Virginia State Police WOULD NOT consent. That completely blows my mind. 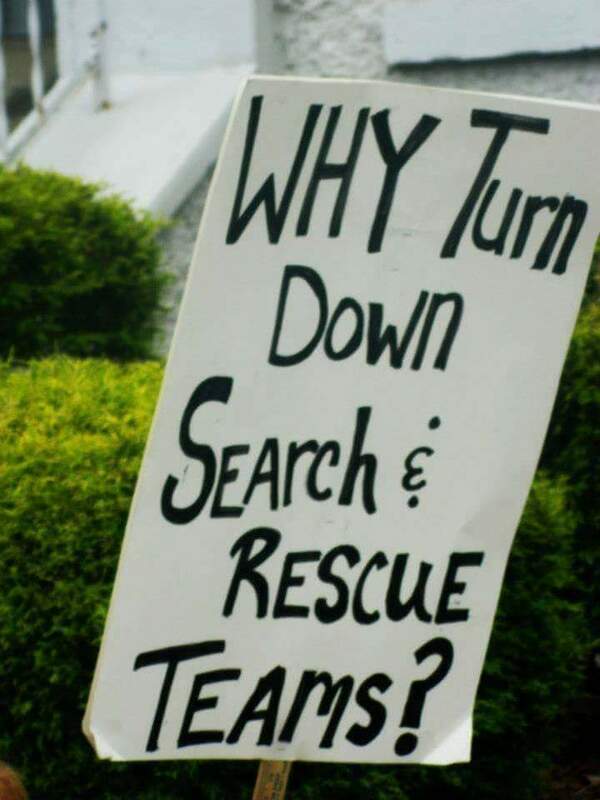 They would turn down free assistance from a nationally known and respected search team. What the heck is going on? Why? They never answered any of those questions for the family. So let’s just consider how any of us would feel if FREE help was turned down, while we’re frantically trying to find someone we love. Needless to say, it didn’t do their fragile relationship with the West Virginia State Police any favors. They have hosted candlelight vigils and protests in regards to how they’re handling (or not handling?) Luke’s disappearance. Please don’t think I’m anti-law enforcement, because that’s not true. I have many friends that are police officers and I know from speaking with them that these cases are extremely difficult, especially whenever no one is talking and no leads are coming in. I’ve just spoken with so many family members who get no help or feel as if they’re getting no help, from law enforcement. A key reason is that there is often a complete lack of communication between the detective covering their case and the family. Series of unreturned phone calls can definitely make you feel as though you aren’t being taken very seriously at all. In this case, it gets worse. 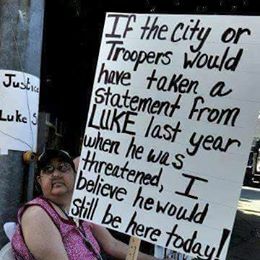 Elizabeth heard that one of the police officers in the area was speaking poorly about Luke while in uniform. 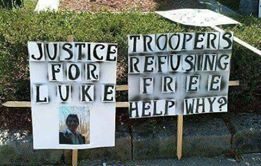 She, in turn, spoke with the Mayor about the particular officers’ unprofessional conduct, and about how Luke had been turned away by the city police earlier when he was trying to file an incident report. The Mayor advised her that he would look into it, and invited her to come to the city council meeting to express her concerns. You can go to Porchlight International to see the archives on this case, including the city council meeting. There were no answers given that day either. 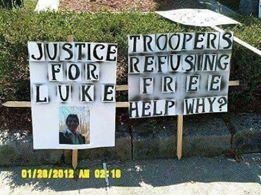 Just for a moment, let me take a side track to something else that happened in Buckhannon, just a few months prior to Luke’s disappearance. In January 2012, a man by the name of Joshua Oberg went missing from the area. To make a long story short, on July 23, 2012, several local men were arrested as Joshua’s body was found in a shallow grave. You can view the news report about this here. If you don’t want to watch the video, basically, Joshua was killed in a murder for hire plot. Rodolfo Villagomez “Chino” Correa hired a couple of people to kill Joshua because he was having an affair with Chino’s wife, Kelli. Why am I bringing this up? Well because Chino had threatened Luke previously (according to statements from Luke himself), pressing the barrel of a gun against his forehead so hard that it left a mark. His mother saw the mark, so she can attest to the fact that something had happened. Yet, the city police refused to take the report and the state police wouldn’t take it because they didn’t want to step on the cities toes. Just think… it could have been possible that if they’d have taken his complaint seriously, it may have prevented the murder of Joshua Oberg…and possibly Luke. W: No, I don’t like you flat out telling viewers lies, was you there? And do you know that Joshua was even a part of any of this mess at that time. Chino held that gun on Luke, my lowed one had nothing to do with it. And Luke told me him self what happened that day. Kelli crying beg-gen Chino to stop so go do your research and come back with some true facts not just the story you want people to believe. B: so are you saying you know more thans told. id like to hear what liz has to say about that so are you gonna delete your post hoping she wont see it. 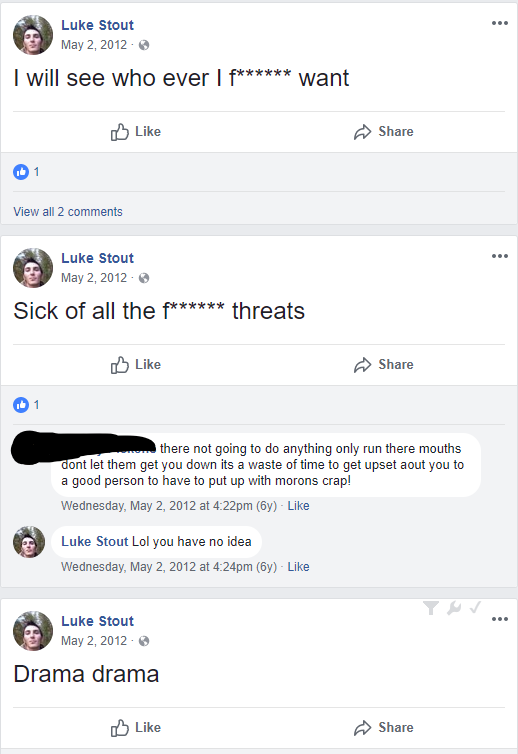 The comments about were made on a Facebook group called ‘Looking for Luke Stout’, it had to be taken down after a while because people wanted to do nothing but start drama and post hateful messages. Something that no grieving family should have to endure. So, was Kelli also seeing Luke behind ole Chino’s back? I mean he did pay to have Joshua murdered, so why would that make it such a stretch to think it could have very well happened to Luke as well? She had in the past went to Granted this is hearsay but looking through the past posts on Luke’s facebook, there were some compelling statements made about drama and seeing whoever he wanted. It was a couple of months before he vanished, but it simply makes the theory all the more intriguing. Oh yeah, guess what Kelli has a cousin named Dillon. If you’re saying why would he have anything to do with it, remember the two hired thugs I was talking about that Chino paid to kill Joshua Oberg? They were also Kelli’s cousins. Money is a pretty powerful persuader…so with all of that in mind, I still can’t figure out why there hasn’t been a really thorough investigation into the possible link. One more thing to note here is Luke’s oldest brother actually confronted Kelli about his disappearance and recorded the encounter. Kelli contradicts her own statements about how she knew Luke, and then when asked about Chino murdering Luke, she said: First Josh, now Luke…anythings possible. I had Liz explain to me about the threats Luke was getting. The rumor floating around Buckhannon was that Chino was going to get Luke when he least expected it. After hearing this repeatedly, he got tired of it and went to the local restaurant that Chino owned and told him if he was going to kill him to do it now and get it over with. Luke even called the police to report that Chino was going to murder him, and when the police arrived they took Luke to jail for disorderly conduct. To me, it makes enough sense to at least check into, and ya know, call his mom and say this is what we’re doing. A little update here and there would go a long way at times. In closing, I really want to know why the local police wouldn’t allow EquuSearch to conduct a search of their own. I want to know if they’ve checked into a possible connection between the murder of Joshua Oberg and the disappearance of Luke. Why didn’t they take Luke’s statement when he was threatened by Chino earlier? Did they question Dillon, who Luke was supposed to meet up on the day he vanished? Why didn’t Dillon call Luke’s house to inquire about him, since he obviously didn’t make it to see him? Who was Luke supposed to be getting a ride from? There are more questions than answers at this point, and moot from the people who can bring an end to the family’s distress. 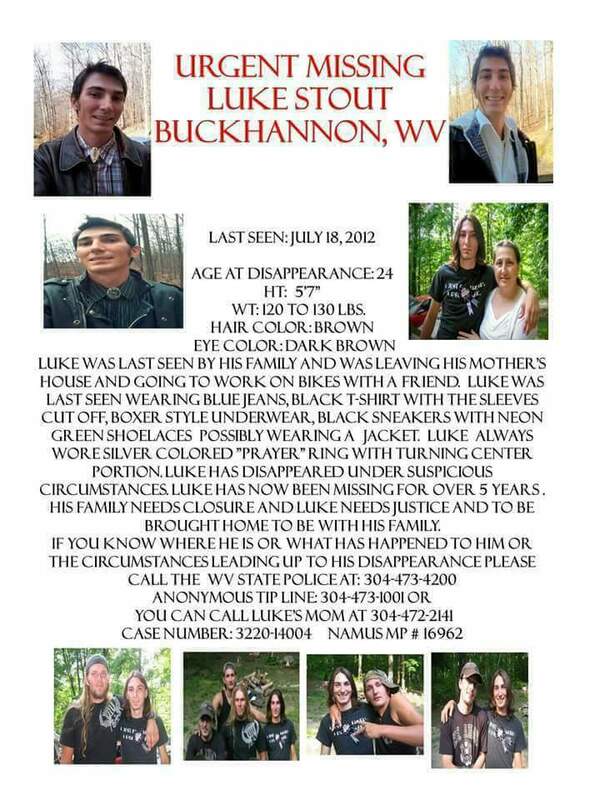 If you think you have any information that could help bring Luke home, please contact the West Virginia PD at 304-473-4200, the anonymous tip line at 304-473-1001, or his mother, Elizabeth at 304-472-2141. You can keep up with his case on Elizabeth’s Facebook page.